I always get anxious for fresh produce in the spring. Last week, I stopped at the local farmer’s market and was devastated to learn it would be TWO weeks before their snap peas came in. Sigh… Summer tomatoes are a long way off yet as well. But if you want that bright summery flavor without waiting, try this salmon recipe. It’s got lots of fresh basil and cherry tomatoes. “Melting” the cherry tomatoes really brings out their sweet tomato flavor. Sometimes I grill the salmon instead of using the cast-iron pan method. Either way works well for this recipe. Best of all, you can have an elegant dinner on the table in a flash. Isn’t this beautiful? Heat 3 tablespoons olive oil in a medium (10-inch) saute pan. Add the onion and saute over medium-low heat for 5 minutes, stirring occasionally, until very tender but not browned. Add the garlic and saute for 1 minute longer. Stir in the tomatoes, 1 teaspoon salt and ½ teaspoon pepper and cook over medium-low heat for 10 to 15 minutes, stirring occasionally, until the liquid evaporates and the tomato sauce thickens slightly. Off the heat, stir in the vinegar and basil. Place a large 12-inch cast-iron pan over high heat for 5 minutes. Brush the salmon all over with olive oil, sprinkle liberally with salt and pepper, and place it skin side up in the pan. Cook the fish for 3 to 4 minutes without moving, until browned. Turn the salmon skin side down with a metal spatula and transfer the pan to the oven for 8 minutes. (The salmon will not be completely cooked through). Remove the fish to a serving platter, cover with foil and allow to rest for 5 minutes to finish cooking. 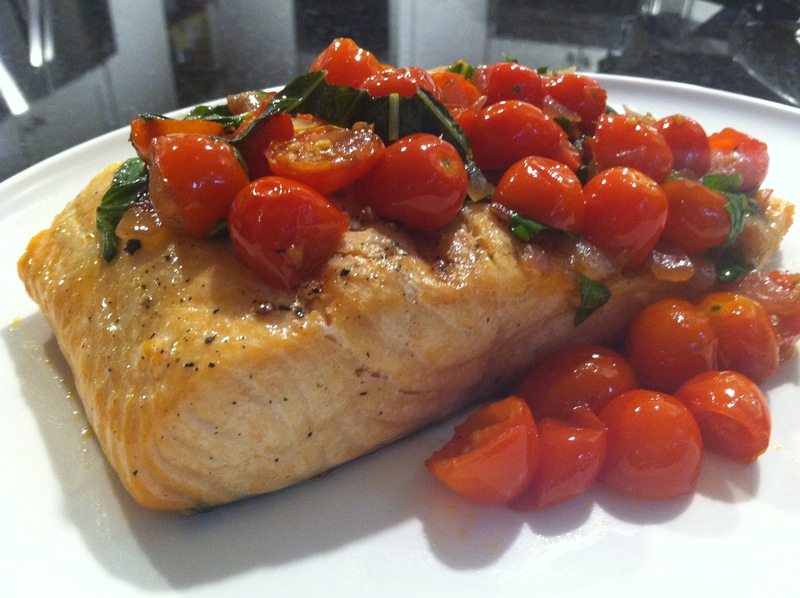 Reheat the tomatoes, season to taste and serve hot, warm or at room temperature with the salmon. Tags: fresh, glutenfree, Grilled, healthy, lowfat, paleo, Salmon, salmon recipe. Bookmark the permalink. Yummy!!!! I love everything about this dish!!! Just found you today. I love this dish! I’ve been making it for a couple years. I like your name better than mine, though. I have called it “bruschetta salmon” because it reminds me of bruschetta topping. Really beautiful, yet simple dinner. Thanks! Hi Elizabeth, thanks for your recent ‘like’ on my food blog. Your website is excellent; the photography and writing are very professional. Keep up the good work!